Last night, Chris and I had dinner together for the first time this week (he was even at the office on Sunday!?) and it was actually the first time we had seen each other in 36 hours. Yikes. Lucky for him I pulled out all the stops with… leftovers. Such a special night. Okay but seriously, ever since being in Spain, for some reason, I couldn’t kick the craving for mac & cheese. No idea where it came from. But Monday night, I cooked up a huge batch and since Chris has been working through dinner the last few nights, it has served as lunch and dinner all week. Okay maybe there was some breakfast mac in there. Don’t judge me. I’m lonely. Okay, so we probably won’t be prancing around our yard with ribbons or waking up at the crack of dawn to wipe my face with wet leaves. But we are hoping to do some gardening and plant flowers, so there’s that. And if they keep making Chris work into the wee hours of the morning I could see myself joining a worker’s rights protest. I will definitely be cooking a lot this weekend since as of lunch today, I’m out of mac and cheese. 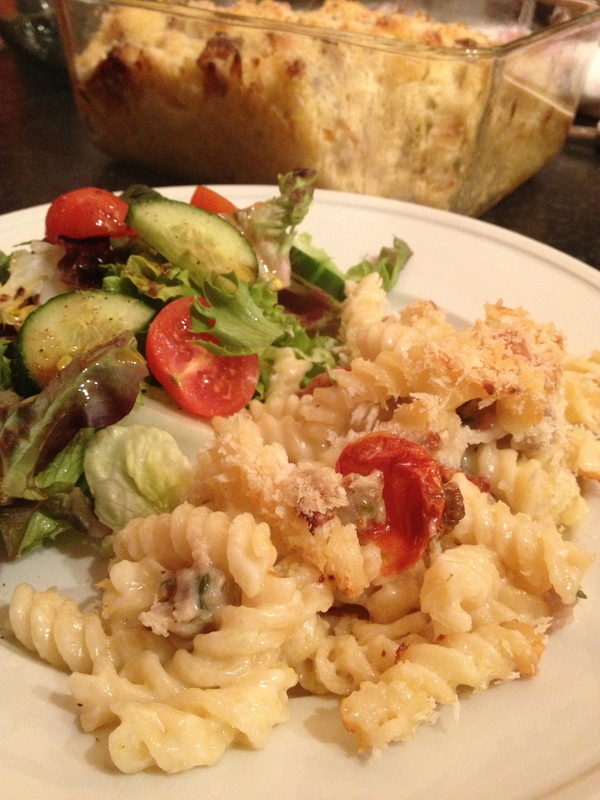 But if you want to make some for yourself, here’s how: I slow roasted some cherry tomatoes early in the day, then mixed up some classic cheddar mac and cheese. I used a combination of sharp cheddar and British Double Gloucester. I also had on hand some pork sausage with leeks. The leeks added an awesome sweet onion flavor, so if you can’t find a sausage with these in them, I would sauté some thinly sliced leeks in with a mild sausage. 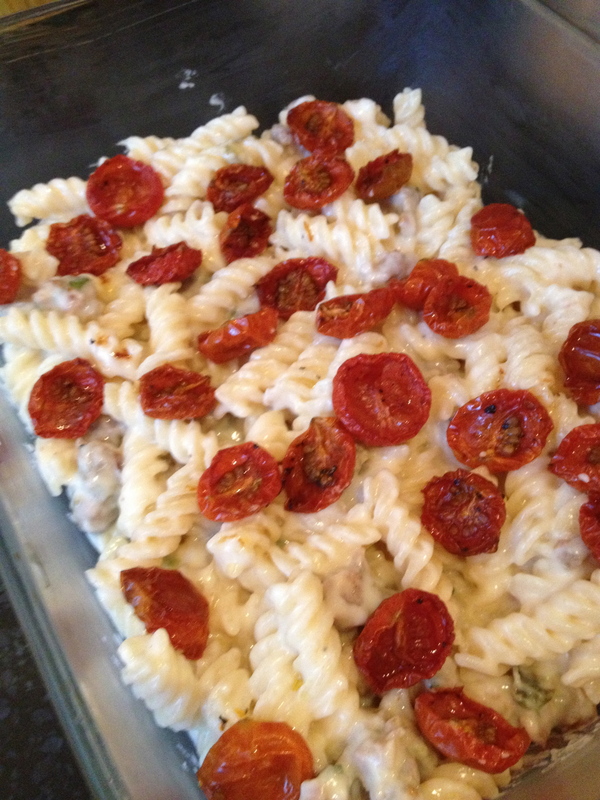 I layered the tomatoes in the middle of the mac and cheese for a bright surprising pop of flavor. 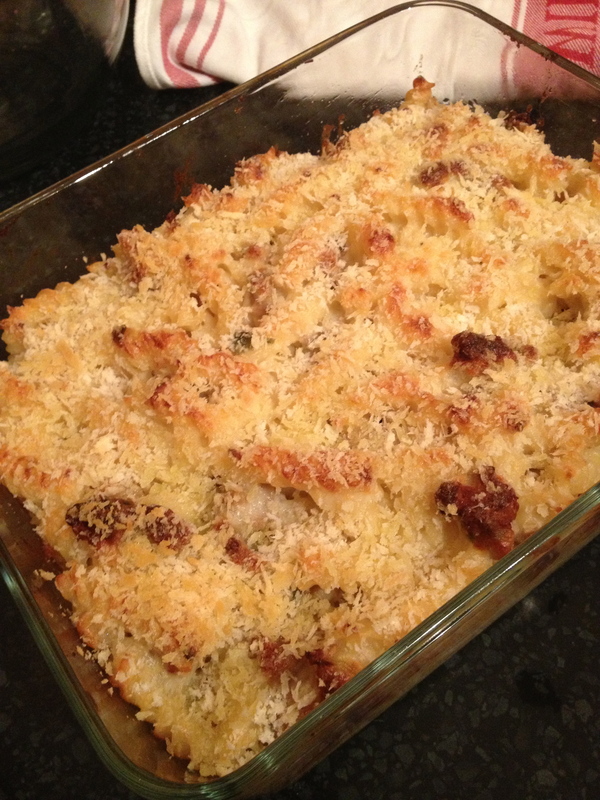 Top with the rest of the mac and then bake until perfectly bubbly and golden (I need to find a new way to describe that, don’t I?? This is what my food writing class is for!!). The top will be crunchy, the sausage making the cheesy bites a bit salty and then the tomatoes in the middle will be bright and slightly sweet and a little tangy. Yes this is a very indulgent dish. And yes, I have been eating a LOT lately. But it’s all about portion control and staying active so you can enjoy over the top bites here and there. See how I attempted to not over do it by filling half my plate with salad. Good for me, right? But maybe we will need to do some maypole dancing after all this weekend. Preheat oven to 250˚F. Slice the cherry tomatoes in half, toss with olive oil, sprinkle with salt and pepper and spread onto a baking sheet. Bake for 90 minutes. Reserve. Remove sausage from casing and sauté in a non-stick skillet, crumbling as it cooks for 5 minutes until browned and cooked through. Reserve. Turn oven up to 350˚F. Bring a large pot of salted water to a boil. Add pasta and cook one minute less than stated on the package, about 7 minutes. Drain. Meanwhile, melt butter in a saucepan. Add flour and cook for two minutes. Whisk in the milk, 2 cups at a time. Cook for 8 minutes until thickened. Turn off heat and stir in the cheese until melted. 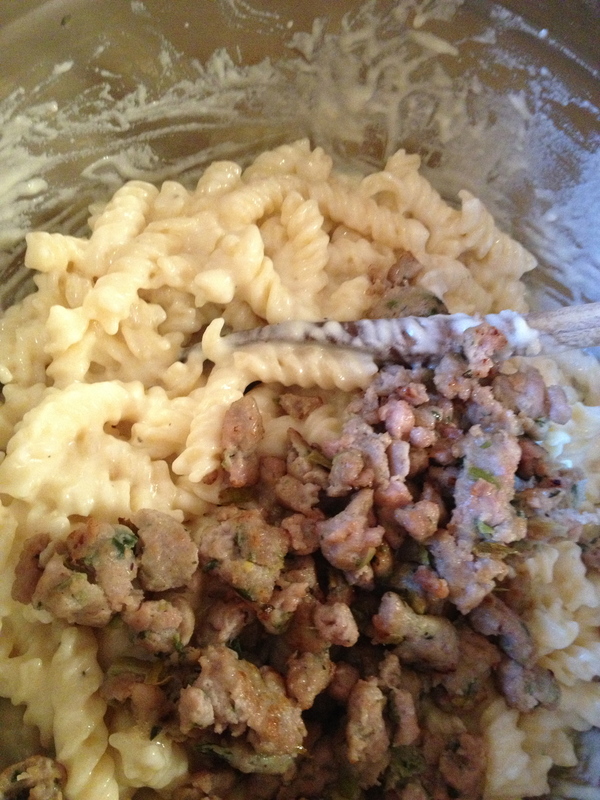 Mix together the cheese sauce, sausage, and pasta. Pour half of the mixture into a buttered 2 quart baking dish. Spread tomatoes evenly atop the pasta. 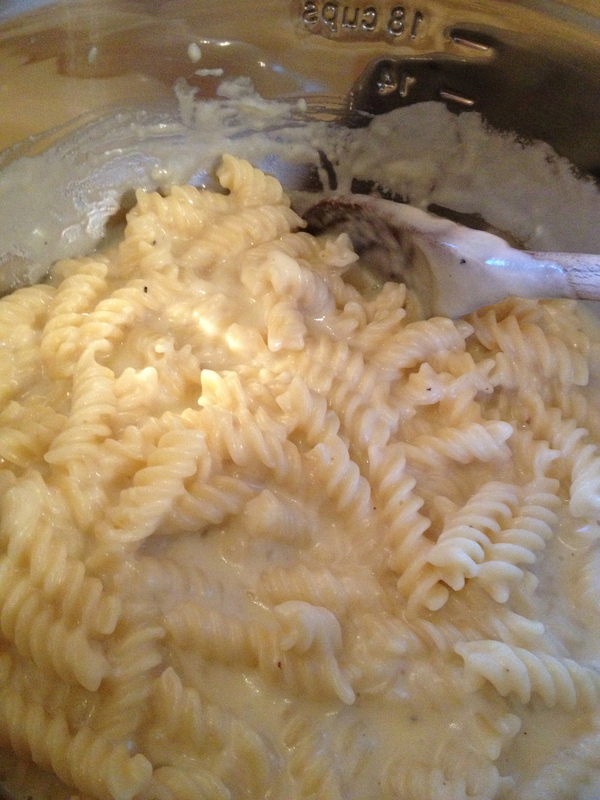 Cover with the remaining pasta and sprinkle with panko. 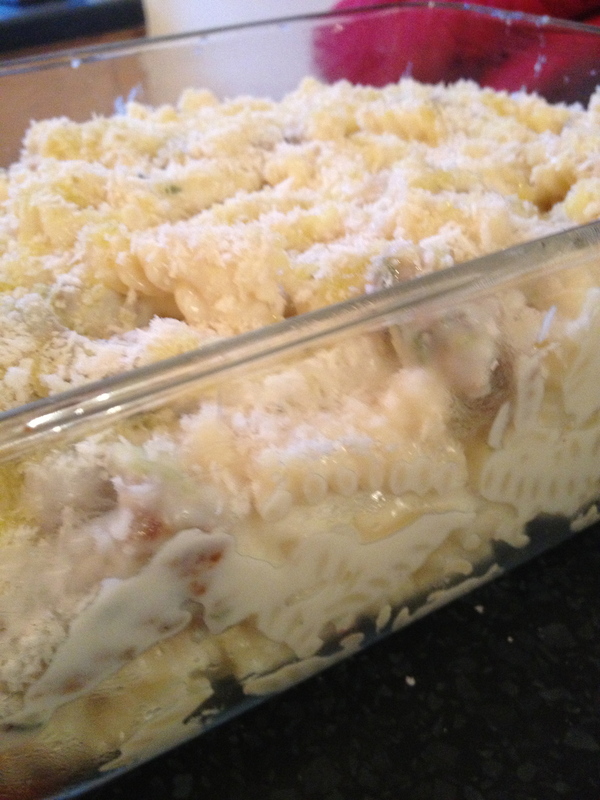 Drizzle with olive oil and bake for 30 minutes, until the top is browned and pasta bubbly. *If you do not have sausage with leeks, thinly slice one cleaned leek and sauté along with a mild sausage. Have no fear, I will be there soon to hang out while Chris works insane hours! I miss your cooking, SO looking forward to it.